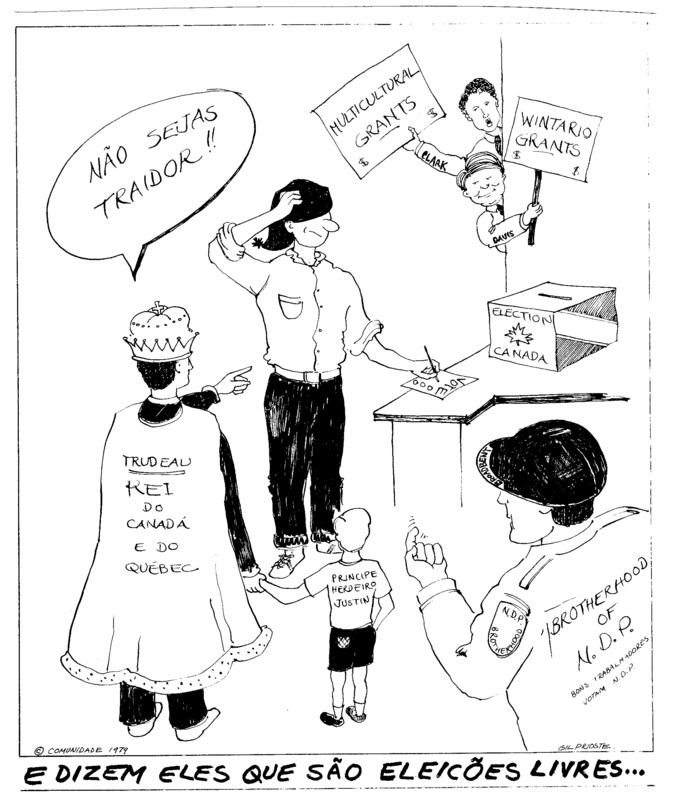 "And they say they're free elections..."
Cartoon 'O CanaguÃªs' scracthes his head while pondering his vote beside a ballot box. Surrounding him are Prime-Minister Joe Clark and the Premier of Ontario Bill Davis, holding signs that say "Multicultural Grants" and "Wintario Grants"; Ed Broadbent, wearing a jacket with the inscription â€œGood workers vote N.D.P.â€, calls him over; and Pierre Trudeau, â€œThe king of Canada and Quebecâ€, holding the hand of â€œthe inheriting prince Justinâ€, exclaims: â€œDonâ€™t be a traitor! 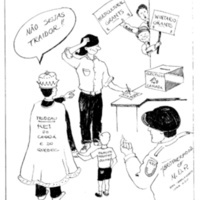 !â€ Below is the inscription: "And they say theyÂ´re free elections..."
Gilberto Prioste, “"And they say they're free elections...",” York University Libraries | Clara Thomas Archives & Special Collections online exhibits, accessed April 25, 2019, http://archives.library.yorku.ca/items/show/2419.